LAST CHANCE TO GET KIT FOR SUMMER! A reminder that our Cuore Team Shop is open, and we now have the new Racing Kit design available to purchase, along with our Club kit. The online shop will remain open until Sunday night, 25-November. If you have yet to confirm your individual custom kit sizing, then please get down to Cuore’s office (2/81 Buckland Ave, Alexandria) during business hours (9am – 5pm, Mon-Fri), and be sure to try on Cuore’s sample clothing; that’s a sure-fire way of getting the correct tailoring options that will give you the perfect fit. Cuore’s 2-in-1 road-suit is also a fantastic garment – a one-piece outfit, rather than separate jersey and bib-shorts – well worth considering as an addition to your cycling wardrobe. Following a number of enquiries, we have also just added yellow arm-warmers to the Team Shop too. 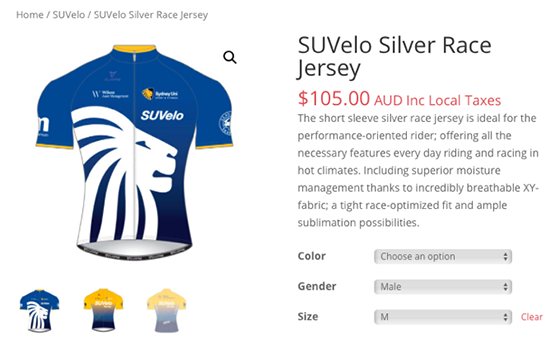 This current order is due for delivery prior to TDU 2019. We are then planning our next order to arrive late April/ early May; that order will include clothing for cooler weather, such as thermal long-sleeved jerseys, ¾ bib-knicks etc. PW: this was provided via email – let Richard know if you haven’t received. Orders placed using this code will be made available to pick up from the Cuore office once the orders arrive. Alternatively, enter your chosen delivery address, and shipping charges will be calculated and added to your invoice total, payable at check-out.